Where Body Meets Soul draws upon my 40 years of experience working with subtle energy healing practices and offers you a clear, accessible manual on energy-based healing. The book’s varied energy practices address your ongoing need for physical, emotional, and spiritual self-care, yet will lead you beyond simply problem-solving symptoms. Using the energy system as the map of health and consciousness, you learn to connect with your body’s energy to clear underlying factors and self-limiting attitudes and habits that compromise your well-being. A natural relationship exists between your energy system and your spiritual connectedness. Through the practice series I bring this essential piece of energy healing forward and guide you to open to your inner source of peace, compassion, and spiritual revitalization. 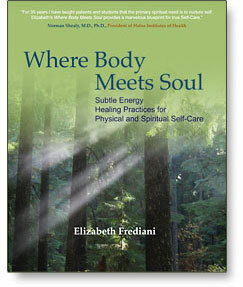 From comprehensive theory to developmental practices, this book will advance your education in the true meaning of body-consciousness-soul medicine. The material and practices in Where Body Meets Soul reflect my background teaching beginning and advanced students, training practitioners, and working with private clients. My emphasis on practical life application is grounding and facilitates integration of the material. Through use of the practices you will transform how you see yourself – and how you commit to yourself. Or you can order at your local book store through the Ingram Book Catalogue.